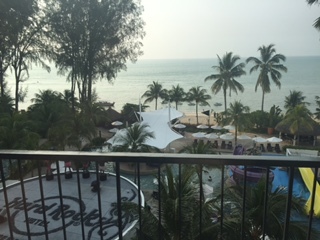 The Hard Rock Penang where we stayed at, is located at Batu Ferringhi, which is an approximate hour drive away from Penang International Airport. We arrived at Hard Rock Penang around 1pm, had our lunch at their Pizzeria (the staff there were really happy and energetic which got us off to a rockin’ start!) and headed over to our room. We booked a Lil’ Rock Star Suite with Courtyard and all rooms in this category are located on the ground floor facing the hills. This meant that each time we retired to our room, we were greeted with peace and quiet. It was also very convenient when we needed to go back to our room to retrieve stuff while the kids were at the pool. 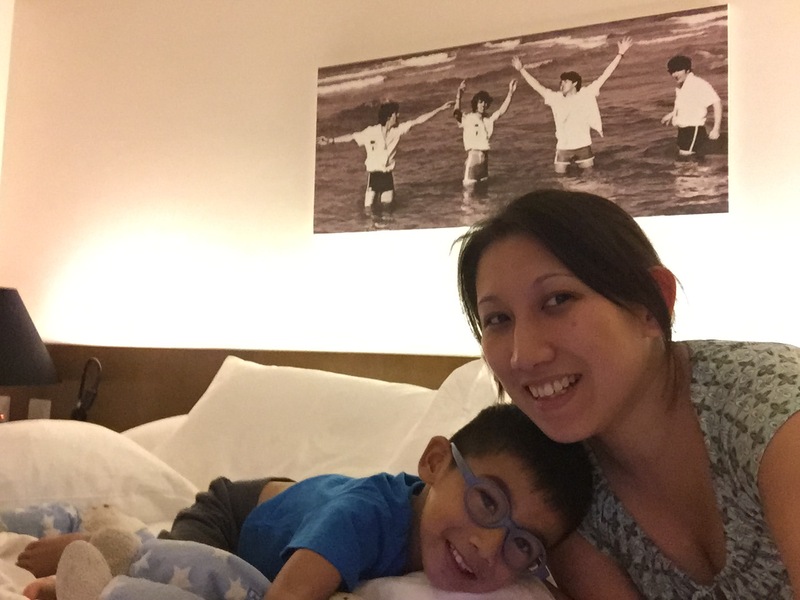 The room had a main ‘parents’ room with a King bed and a smaller ‘kids’ room with a single bed and a trundle bed. Captivated by whats in store..
We love hanging out on the big bed! 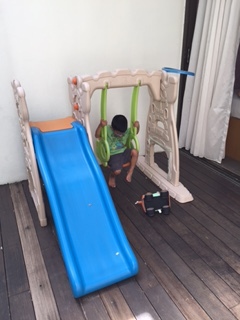 The room also opened out into a courtyard which had a swing and slide set. 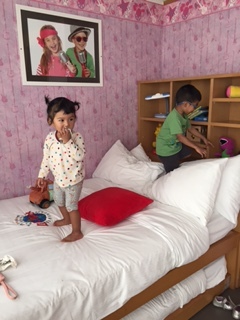 The kids were very excited when they discovered the kids room which was filled with lots of familiar toys. 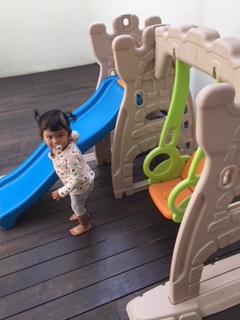 While the courtyard as well as swing and slide set was a good-to-have and one of the reasons why we chose this category of rooms, the kids never really played there apart from the first day. Perhaps it was because there was just so much to do in the hotel and they have a good Kids Club to begin with. 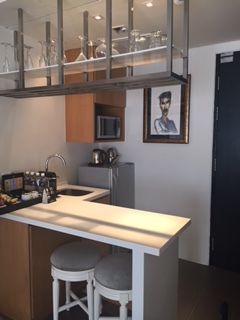 For info, the hotel also has some rooms in this category (Lil’ Rock Star Suite) located on the upper floors however they do not come with a courtyard. I would say this category of rooms is really suited to families with 2-3 kids. As long as your kids can co-exist in the same room space, you will do fine here. 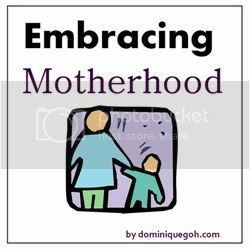 As our kids currently sleep in different rooms at home and are easily distracted by each other, having them in the ‘same space’ makes it a little difficult for us to get everyone to sleep. Also the ‘parents room’ and the kids room are not separated by a full wall, rather they are sectioned off therefore noise and light may be an issue if parents want to stay up late to watch some tv when the kids are asleep. (My kids especially Jah, needs to sleep in complete darkness so it was slightly tough). However it is generally a fun room to be in and it means you don’t have to pack much toys for your kids. Oh and did I mention that the room also comes with its own PS3 especially useful for teenagers and the big kid aka the husband. For some unforeseen reasons, we had to extend our stay by a night and as a result we had to upgrade our room as our existing room category was not available for extension. The lovely front desk staff, Bell was very helpful in getting us out of our predicament and went out of her way to find a solution for us. The result was we moved from the Lil’ Rock Star Suite to the Rock Star Suite, yes one for the kids and now one for the adults! Jah was initially very upset about moving rooms but he was equally blown away when he got to the Rock Star Suite. The Rock Star Suite came with a kitchenette (which was perfect for us as we still had two kids who needed to have their formula milk), a dining table (very useful for our room service lunches), a living room (where we set up a single bed), a master bedroom (separated from the living room by a sliding door), a walk-in wardrobe, a common toilet with shower, a master toilet with a bath tub and lastly a balcony which span across the length of the living room and master bedroom. 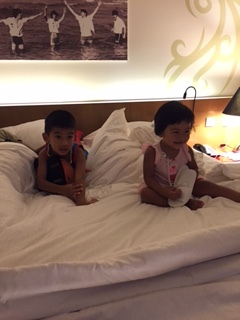 The kids loved the space in the room and the nice view of the pool, beach and sea from the balcony. Big space for play = Happy Loving Kids! On top of that, the Rock Star Suite also came with Kings Club perks which includes gourmet breakfast at the Kings Club, Afternoon Tea and Evening Cocktails. 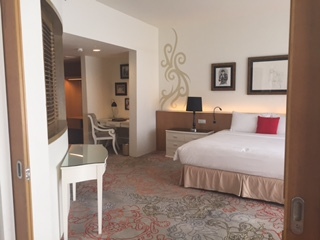 The only reason I would not recommend this room for families with kids would be the fact that noise travels up from the pool side area which can be filled with screaming kids in the day and also music from the live band can be heard between 745pm to 1015pm. But if your kids are not fazed by noise or do not need afternoon naps or are not early sleepers then this room would work great! While our kids sleep pretty early (9pm) and need naps in the afternoon, they were usually quite tired at the end of each morning or night and so we manage to deal with the noise. I’ll have to say that all of us including the kids preferred our Rock Star Suite better so we were also ready to put up with a little bit of noise for more space and comfort. 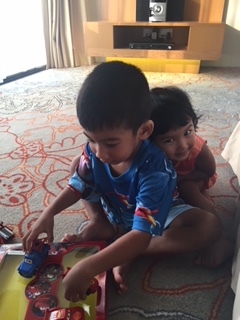 Overall I will have to say that Hard Rock Penang provided awesome service to all their hotel guests regardless of room type and we and the kids always felt special and looked after. In fact Bella left her teddy bear in the Lil Rock Star Suite and it was placed in our Rock Star Suite even before we noticed it was missing. What impressed me was the fact that they have so many toys in the Lil Rock Star Suite but they still managed to identify the bear that ‘didn’t belong’ 🙂 Definitely coming back again!! View from our room..Welcome to Hard Rock! We stayed at Hard Rock Hotel when we went to. Penang years ago and loved that it was so close to the beach and butterfly club. 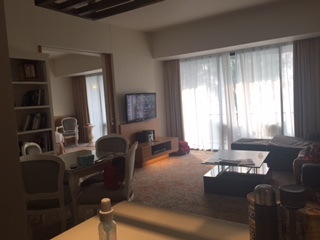 Both rooms look awesome and I do agree that the noise from the pool can be pretty loud with the live band. Sounds like you had a great holiday.